“I remember our first meeting,” says Borys Lankosz of his mentor, Wojciech Jerzy Has. Lankosz, then a student at the Łódz Film School, had just completed work on a screenplay. He was due to shoot the piece as part of his second year programme. Professor Has, a fabled figure in the Polish film world, was to be the artistic supervisor. The old director, already somewhat infirm, began going over the script with the younger artist. “Has was taciturn by nature, but I had the feeling that every sentence I heard from him was perfectly to the point,” Lankosz recalls. Before long, the master had homed in on a particular scene. “I explained that it was a dream sequence of the main character,” Lankosz relates. However, the student was unprepared for his teacher’s response. “In the film I supervise, no one will be dreaming,” Has declared. It was a perplexing statement. The budding director returned to his lodgings somewhat bewildered. What was he to make of the encounter? After all, Has was acknowledged as the supreme conjurer of dreams. His otherworldly forays had set the standard for other filmmakers to follow. “It took me a while to understand what my old master was trying to say,” Lankosz continues. “I read my script again. Suddenly, everything seemed to be too obvious in its symbolism, too simple in its attempt to create a dreamy impression. “A film by its very nature is like a dream. When you want to dream within a dream, it takes a great idea to achieve that effect. One of the ways is to show everything as real as possible and then start discovering tiny rifts in the reality you have created. These rifts should become bigger and bigger over time. This autumn marks 10 years since Wojciech Has made his final exit. A wave of new books has just been published, retrospectives are being screened, and restorations of his classic films will soon be available on Blu-ray and DVD. Exhibitions and debates complemented a major review at last month’s Era New Horizons Festival. Yet the director has not always been in the limelight. Although hailed as an exceptional talent during the 60s and 70s, Has’s star seemed to wane over the following decades. In the West, he was overshadowed by fellow Polish filmmakers such as Wajda and Kieślowski. This was not without reason. 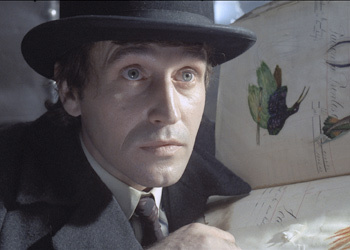 The film that’s widely cited as his masterpiece, The Hourglass Sanatorium (Sanatorium Pod Klepsydrą, 1973), was not to the tastes of the communist authorities, who forbade it from being sent to Cannes. Showing considerable bravado, the director had the film smuggled out of the country, and it duly won the Prix du Jury. Needless to say, the powers that be were not amused, and it would be 10 years before Has was given the green light to make another film – as it was, the modestly titled An Uneventful Story (Nieciekawa Historia). “Has suffered some quite unpleasant experiences and he became very closed and introverted,” says Professor Maria Kornatowska, who befriended the director in the late 70s. “He became marginalised, and many projects were unrealised. So begins Bruno Schulz’s pre-war tale, which provided the inspiration for Has’s film, The Hourglass Sanatorium. Adapting a work, or rather works (Has blended elements from several stories) by the so-called “Polish Kafka” might seem foolhardy for a director. Schulz, an assimilated Polish Jew who was shot down in the street by a German soldier in 1942, wrote some of the most whimsical, fantastical tales in the European canon. “People keep asking me whether I am afraid that a film based on Schulz’s prose will not be communicative enough,” the director remarked in an interview. In the film, narrator Józef journeys to a peculiar provincial town in search of his ailing father, who is lodged at the local sanatorium. But his destination turns out to be a portal to a rather peculiar world. If there are any medicine bottles left in the sanatorium, they have been tipped over many years ago, unleashing a horde of unseen genies that transport Józef back to the world of his childhood. Youthful fascinations and insecurities are played out against a hallucinatory canvas where apparitions from his past soar about with all the shimmer of a Chagall painting. Dismissed by a middle-brow English magazine as “Polish weirdness” and “the kind of film that Terry Gilliam would make if he was allowed,” The Hourglass Sanatorium is actually one of the great films about Poland. In the short story, the sanatorium is deserted, save for a rather eccentric doctor and nurse, both as elusive as Carroll’s white rabbit. The only patient is Józef’s befuddled father. The patient’s room is described as dusty in the tale, yet Has goes several steps further and turns the entire building into a decrepit shell. Whole portions of the balustrade have collapsed and windows are broken. For the original Polish viewers of the film, a story about a man trapped in a rotting world, haunted by ghosts of the past, could hardly fail to evoke parallels with the Poland of 1973, in which so much of the country’s heritage was on a steady course of deterioration. The sanatorium looks rather better than most manor houses, synagogues and the like that had managed to survive the war. Krakow, the city where Has himself grew up, was by then a sorry shadow of its former self, awash with crumbling, blackened buildings, and insipid, empty shops. When Józef first catches sight of his childhood self, the boy is dressed in the sailor’s costume that was so popular in the polite society of yesteryear. Yet when the narrator reaches the window, the boy has vanished. Only ravens remain – and the furious barks of dogs – as if the child has been devoured by history. Technically, Has sets his drama in a sort of turn-of-the century time warp, where Emperor Franz Joseph still sits on the throne. This was the world of Bruno Schulz’s own youth – Galicia, the Habsburg kingdom that stretched across southern Poland. Has was born in the heart of those lands, and although by then the empire was no longer, the flavour of those provincial towns, with their lively orthodox Jewish communities, was little changed. It would remain so up until the Second World War. Has brings the Jewish dimension very much to the fore in his film, much more so than in Schulz’s tale. Sanatorium becomes a requiem for an entire world, culminating in the haunting, candle-lit finale. It’s hardly surprising that the authorities felt uncomfortable about such a film, not least given that the communists had stage-managed an anti-Semitic campaign in 1968, compelling about 30,000 Poles of Jewish descent to leave the country. This was pretty much the end of Jewish life in Poland. This, coupled with the ordeal of a man who is trapped – Has’s favourite theme – and a tangle of ambiguous references to freedom, appears to have made the film unpalatable for some. “Did you know sir, that your dream has been noted and severely criticized in the highest places?” So Józef is informed whilst being arrested by a soldier at the end of the film. This comes straight from Schulz’s “Spring”, but such elements, accentuated by Has in his own script, seem endowed with a fresh resonance under the director’s baton. Has worked with some of the finest talents available for The Hourglass Sanatorium, including production and costume designer Jerzy Skarzyński, and cinematographer Witold Sobociński, who remembers that details had to be followed with great precision. Yet it seems that they were happy to fall in with the director’s demands. For the curious, the results can be savoured anew in this year’s restoration by KinoRP. Each shot emerges as fastidiously constructed, and yet executed with a seemingly effortless, bewitching grace. “A fundamental milestone in the history of the cinematographical language” is how Le Monde hailed the work many years ago. And of course, the film exudes an uncanny aura so thick that it could be cut with the proverbial knife. That said, out of respect for Mr. Has, one should use an antique silver pastry knife, decidedly Art Nouveau. Two of Has’s classics are currently available on the English market, The Hourglass Sanatorium and The Saragossa Manuscript, thanks to the excellent Mr. Bongo Films. The latter film was resurrected by the intriguing triumvirate of Martin Scorsese, Francis Ford Coppola and Jerry Garcia of the Grateful Dead. In Poland, KinoRP is currently working on a series of restorations, the first of which, The Hourglass Sanatorium, is due for release on Blu-ray this autumn. Pingback:The Hourglass Sanatorium (Wojciech Jerzy Has, 1973) | Make Mine Criterion! I watched this film last night, courtesy of Mr. Bongo; and thought it the most wonderful, enigmatic and phantasmagorical film I have ever seen. I have long been a fan of ‘The Saragossa Manuscript’ and have that also on DVD. For me, Wojciech Has is one of the world’s greatest film-makers, having also seen on Youtube ‘The Noose’, ‘Harmonia’ and ‘How To Be Loved’. I am a professional storyteller and tell a version of ‘The Saragossa Manuscript’ with guitar accompaniment but I could not have put that together without Has’s film to whittle the plot down. But ‘The Hourglass Sanatorium’ surpasses even that film in its daring, in the complexity of its images and in its profound and dreamlike depiction of the human predicament. It is a true fairytale for our times and is, ultimately, almost unbearably moving, like so many of Has’s films. It’s also very funny! Hats off to KinoRP and Mr. Bongo Worldwide! for a restored masterpiece. We want more!